I’ll be set up at the Adirondacon Tabletop Gaming Convention in Queensbury, NY this weekend with copies of my Allfield Preview Decks. You’ll be able to pick one up for ten bucks, learn how to play, and we’ll be playing if you want to join. I’ll be making drawings while I’m there, plus I’ll have some giveaway items and printed directions. This event is a gaming event so people can come play all sorts of tabletop board and card games here. There will even be tournaments, raffles, and more for a good cause. This will be at the Aviation Mall at 578 Aviation Rd, Queensbury, NY 12804 at the Party Palace near the entrance. The hours are 10 to 10 on Saturday, and 11 to 6 on Sunday. If you’re in the area and thinking of coming, let me know so I make sure I’m at my table when you come! This and other upcoming events are on my calendar right here. For more information on Adirondacon you can click here. 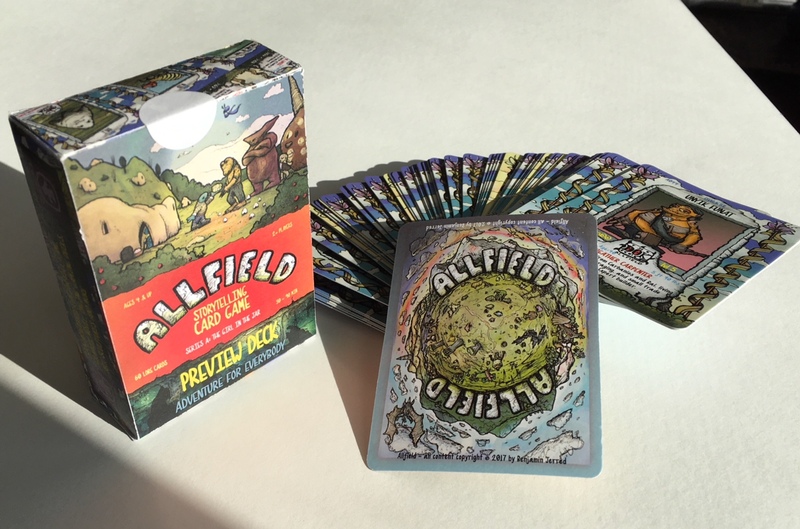 Get an Allfield Storytelling Card Game Preview Deck for $10! Play Allfield online at Roll20.net!